utlook conversion tool is amazing and dominant application which converts Outlook Emails into TXT, EML, MSG, RTF, HTML, VCF & MHT format with the help of our PST conversion tool. 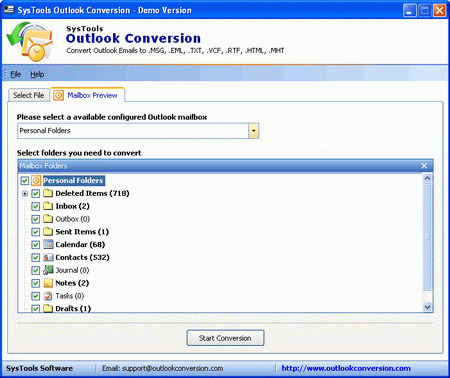 MS Outlook PST converter can smoothly convert mailbox items (Inbox, Contacts, Drafts, Deleted Items, Sent Items, Notes, Journals, Calendar, etc) of ANSI and Unicode file including all Metadata information like to, cc, bcc, sent/received date/time, attachments & subject. Our Outlook conversion software can convert both orphan & configured PST files instantly.